Conclusion 2: Do the math, make the effort, a simple checksum will often do - many lies are easy to catch if you at least try. Trust nobody! In theory, central banks control things like economic growth and consumer price inflation, by setting their policy rates (a set of interest rates that banks pay or receive when borrowing or making deposits at the central bank. In practice, their theories, models, and actions are at best worthless but most likely incredibly harmful. Central banks often publish their forecasts for various macroeconomic variables, including their own policy rate (that they themselves can control to a fundred percent certainty). Amazingly, even though central banks are supposed to understand how the economy works, and how their policy rate is supposed to decide among other things the future rate of inflation - and thus also what the appropriate future policy rate would be - the CB prediction errors for their own policy rate are higher than for any other phenomenon tou can think of. Not only are the errors wrong in direction (which would be completely out of the question if their models had any relevance for the real world), when they get the direction right they are often an order of magnitude (10 times) wrong in amplitude. 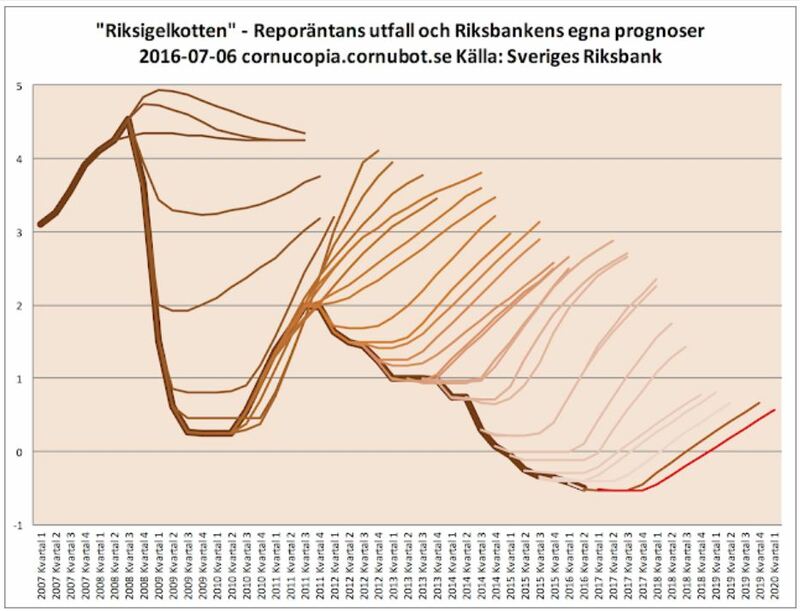 The following picture shows the situation for the Swedish central bank "Riksbanken"
On September 6, 2018, the Swedish central bank, known for being the oldest and most retarded central bank in history, publishes its latest stupidity (interest rate decision). Just 15 years ago, careful modelling and the most thoughtful decision process Riksbanken's members could muster resulted in a policy rate of 500 per cent. Yes, that's 50 000 basis points. 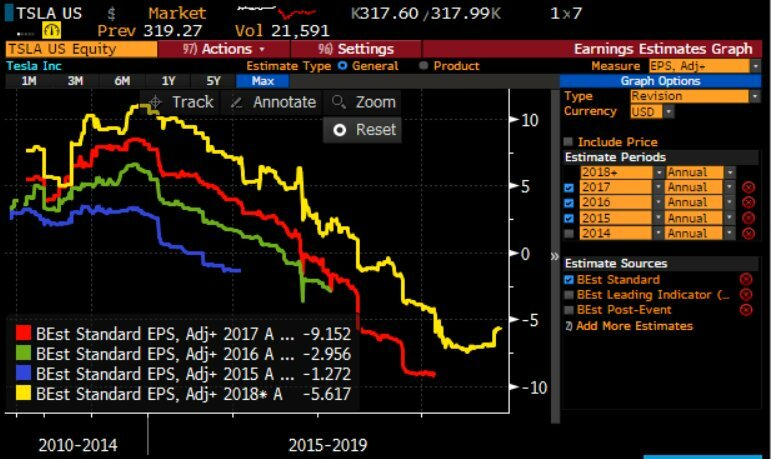 In a few weeks on September 6, they are expected to stick to their current world record breaking moronic idea of a negative interest rate being prudent, effective, and simply the absolute best the central bank committee members can conceive. Take a look at the chart below. Yes, they really are that oblivious. In over 25 consecutive predictions, consistently predict increasing the rate (that they control, Nota Bene) by 1.5-2 percentage points over the following few years, but in every single instant actually reducing the policy rate, most often ending up some 2.5 percentage points below their own prediction. Most of these decisions are so wrong, ignorant and stupid that they defy mathematical description. How wrong actually is going from +1.0 per cent to -.5 per cent while predicting going to +3 per cent? How can they, or anybody else for that matter, have any confidence whatsoever in what they are doing, when they predict increasing the policy rate by 5x from 0.5 per cent to 2.5 per cent, but actually lowering it to a NEGATIVE 0.5 per cent? It is by now of course patently obvious that the Riksbank members have no clue what they are doing, that their models have no relevance at all for the real economy, that they are perfectly incapable of adapting (25 consecutive predictions that were completely off the mark, remember? ), and that they have no concept of the complexities of real life and the dangers of unintended consequences of their retarded experiments -- ever heard of phase shifts* for example? Question: Do you think the authorities have this covered? Do you think they know better than you, or even than most? Think again, their models and myopic thinking combined with greed and hunger for power have made them the least fit of all to do what they are doing. And yet, the more damage they do, the more power they are awarded. Oh yeah, this will end well. If you own physical gold that is.